Unlike Maulidi, the annual ancient Swahili event celebrating birth of the Prophet Mohammed, Cultural Week is a tourist event celebrating of Lamu Old Town as a UNESCO World Heritage Site with more than 700 years of continuous settlement. And for better or worse that means no cars on the island. 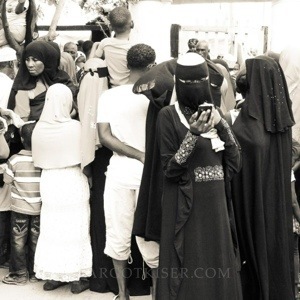 Organized by the Lamu Cultural Promotion Group, the three day festival showcases traditional dances, displays of handicraft and competitions on land and water, among them Swahili poetry, donkey races, dhow races, henna painting, Swahili bridal ceremony and musical performances. 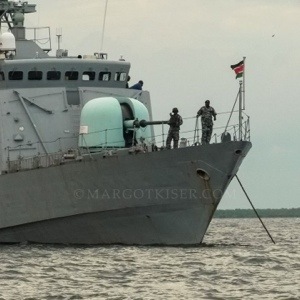 Recent additions include stalls sponsored by Save Lamu, a fast sprouting grass roots environmental organization whose goal is to help local communities mitigate potential harmful fallout from construction of a proposed 32-berth deep water port. The short movie I took from second floor of DC’s office building. Administration Police watch over the crowds at an event that follows the Westgate siege in Nairobi two months previously. 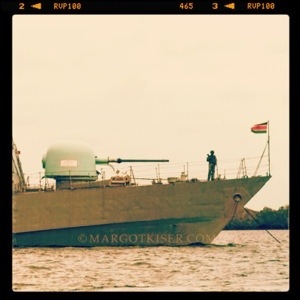 The arguably menacing presence of a Kenya Navy warship was clearly a message to Somalia and interpreted by some to be an aggressive stance saying, tupotu — we are here. So, Somalia, don’t f–k with us. 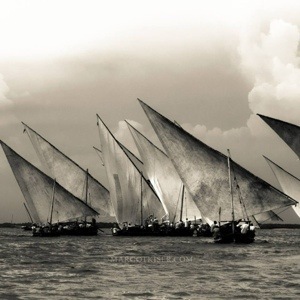 Two of the legion dhow races were held today. 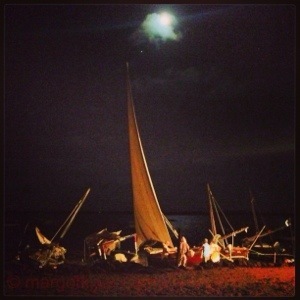 A dhow belonging to Lamu Conservation Trust won one race. Herbert Menzer, a part-time Lamu resident from Hamburg, Germany, has over the years built several elegant and exquisitely finished villas. Every year he sponsors cultural events including Lamu Painters Festival and hat contests in which local construction workers are encouraged to create hats using materials from construction sites. Elaborate tribal masks have been known to lose out to hats made entirely of cement. 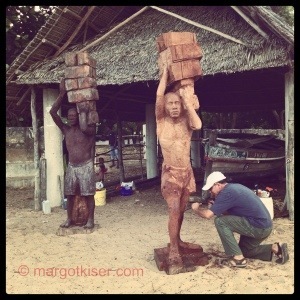 Below, Joachim Sauter, a sculptor from Germany, shapes a solid piece of mahogany as a tribute to the many hard-working men on Manda Island’s Maweni quarry. These men load old dhows with coral blocks across an often treacherous channel to build villas in Shela and Lamu town.